AMWRRO in conjunction with project partners ElectraNet and the Australian Governments – Caring for our Country grant program will be revegetating a 3.7ha area of the Port River Estuary (North Arm) with the protected Grey Mangrove tree. This area is under constant environmental stress due to inappropriate activities e.g. speeding vessels, anchoring and bait digging, to name but a few. This revegetation project has been designed to introduce additional Grey Mangroves to the Port River estuary in an attempt to help sustain the constant decline in numbers in this extremely important estuary. This project will also introduce additional habitat for marine species that rely on the Grey Mangrove forests for protection and food. AMWRRO plans to introduce over 500 Grey Mangrove trees that will initially be nurtured at the AMWRRO rehabilitation facility (Torrens Island). When large enough, these trees will be transplanted into the designated areas on the southern side of the causeway leading to Torrens Island with help from the North Haven Schools – Junior Dolphin Ranger Program. This area will be fenced off for approximately four years in order to give the newly-transplanted trees enough time to establish themselves as a sustainable mangrove forest and, to encourage germination of new trees from the original stock. 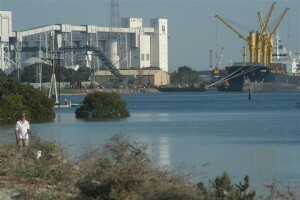 The Barker Inlet and Port River Estuary has the largest southern most colony of Grey Mangroves on earth, unfortunately the Port River Estuary Grey Mangroves are often found damaged and dying as a consequence of human recreational activities and careless industrial and governmental developments. 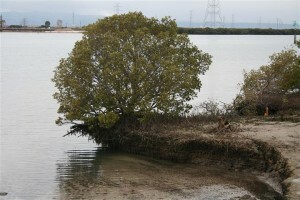 Mangroves are plants that live between the sea and the land and are inundated (flooded) by seawater tides daily. This is called the ‘intertidal zone’. Mangroves are extremely important habitat for birds, mammals, crustaceans and fish by providing a breeding place and much needed protection from the greater open ocean. Mangroves also improve water quality by filtering pollutants, stabilising and improving the soil and protecting shorelines from erosion. 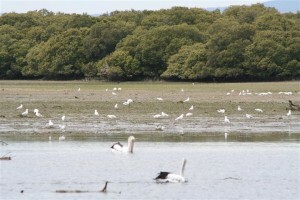 Mangroves are an important part of the food chain for many animal species. Mangrove trees produce a large amount of organic litter such as leaves, twigs, bark, fruit and flowers. Some of this immediately becomes food for marine wildlife such as crabs, but most breaks down before being consumed by other animals. Bacteria and fungi break down the organic litter, increasing its protein and turning the organic litter into food for smaller fish (spawn) and prawns. They in turn produce waste which, along with the even smaller mangrove litter particles are eaten by molluscs, small crustaceans and plankton or, if they land on mud flats on low tides; is eaten by animals such as crabs. Daily tidal movements flush estuaries into the open sea; distributing large amount of organic food, this inturn attracts more animals to the area for protection and food (hence the importance of estuaries). 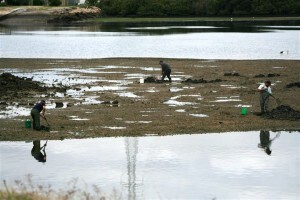 This food is dropped over a huge area and feeds bottom dwelling species, prawns and fish. One advantage for mangroves is that in a salty environment there is less competition due to fewer plant species able to withstand these salty conditions; compared to a tropical rainforest where there are many different species of plants, all of which are competing with each other to survive. There are approximately 30 different species of mangroves in Australia, all of which are extremely important for our coastline and estuaries.